In December 2018 Fleur Ng'weno and a team of birdwatchers found the third colony of Clarke's Weaver. All 3 records of breeding were of nests in sedges in wetlands in the Dakatcha woodlands. The breeding seasonality varies widely, probably depending on local rainfall, as the sedges need to be in standing water. 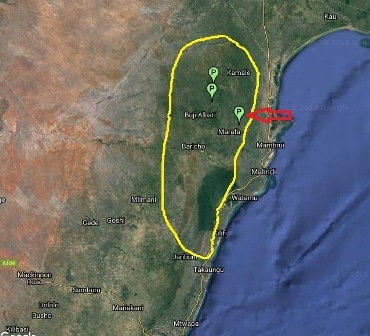 The colonies are north of the Arabuko-Sokoke Forest (dark green patch in google satellite photo below), the forest being the traditional locality for birders wanting to tick this species.